Fisheries biologists from Colorado have discovered high levels of Tetrahydrocannabinol (THC) in their state's trout waters. For non fishing guides, THC is the active ingredient in marijuana. Elevated levels of the compound were first noticed during a recent survey on the state's aptly named "Dream Stream". Marijuana or "Mary Jane" as it is also called, is legal in several Western states. It is believed that the contaminant may be the direct result of cannabis using anglers "answering nature's call" during their time on the water. 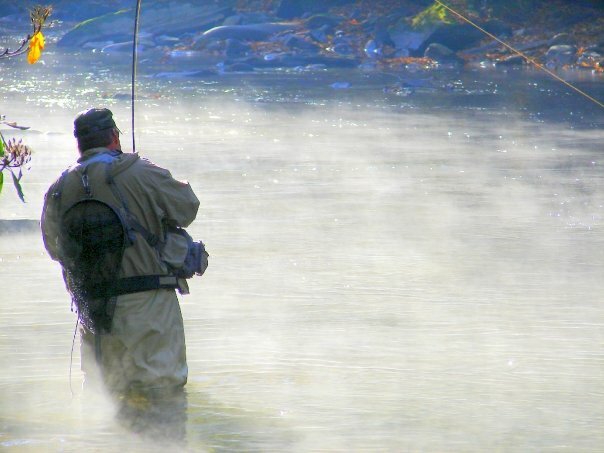 Anglers who frequent the state's once pristine trout waters have reported an enhanced sense of mellowness and oneness with the river. Although, some have experienced darker feelings, including the sense that "the game warden is literally behind that tree right over there." Effects on trout are largely unknown but fish have been reported lackadaisically hanging out near the tail of pools with bloodshot eyes and voracious appetites. One local fly shop owner is making the best of this environmental challenge by selling a line of fly patterns (or trout edibles) that take advantage of the situation. "Mark my words, it wont be long before anglers visiting my shop are telling tales of catching massive trout on size 22 Doritos flies." Overall, the impact on fisheries tourism seems to have been a net positive with the shop's new #420onthewater hashtag, already having a large following. To see other articles which we have posted on April 1st follow this link.